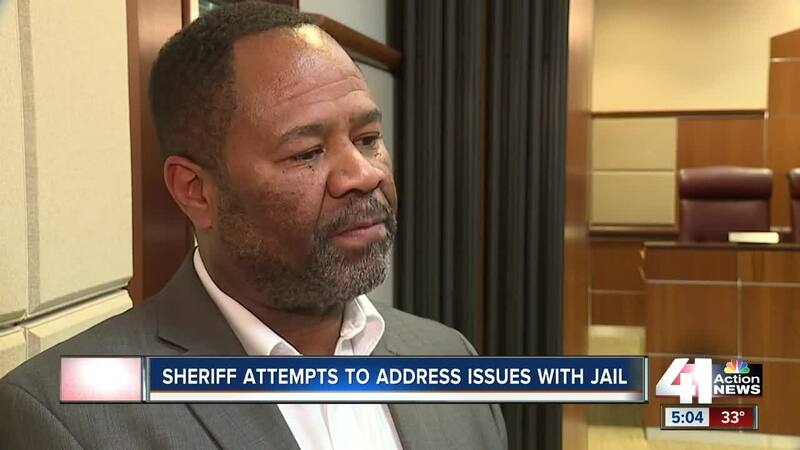 Jackson County Sheriff Darryl Forte was planning to talk to county lawmakers Monday on two issues regarding the jail, but he never got the chance. INDEPENDENCE, Mo. — Jackson County Sheriff Darryl Forte was planning to talk to county lawmakers Monday on two issues regarding the jail, but he never got the chance. Forte said he wasn't on the agenda for the County Legislature meeting but that in the past, lawmakers have acknowledged him anyway. They would not do so on Monday, he said. Forte told 41 Action News that while he was out of town last week, several legislators, whom he declined to identify, showed up at the jail to speak with inmates. He called those actions "dangerous" for both lawmakers and corrections officers and said they pose a civil liability issue. Forte said he also wanted to talk with those legislators to see if they had plans to keep inmates safe and secure as he transitioned into his new role as head of the jail. Forte, who was appointed interim sheriff in May 2018, was elected to a full term in November and took over operations at the jail on Jan. 1. The jail has been plagued by problems, including maintenance and overcrowding. "The jail has been under my command about 42 days, and a lot of people have had a lot of time to do a lot of things," Forte said. "Now all of a sudden they’re looking at me saying, 'What are you going to do?' I'm ready for it if we have the right team in place, I'm ready to do it, but we’re not going to do in 42 days what some haven’t done in 15, 20 years." Forte said that he plans to set up a time to address the County Legislature. At that same meeting on Monday, lawmakers did receive an update on the cleanup progress at the downtown Jackson County Courthouse. County Executive Frank White and Public Works Director Brian Gaddie told the governing body that the building is currently being dehumidified after two busted water pipes damaged the basement and sixth floor of the courthouse. The two said the damage wasn't as severe as it could have been. A historian was brought in to assess the damage. In the meantime, White's office will prepare a summary for the County Legislature on the maximum amounts that insurance will cover. The county had not said publicly how much the watery mess will cost. The courthouse is expected to reopen on Feb. 19.